Zahir Janmohamed lives in Ahmedabad and is writing a book about the aftermath of the 2002 Gujarat riots. He previously worked as a senior foreign policy aide to Congressman Keith Ellison and as the advocacy director for Amnesty International. 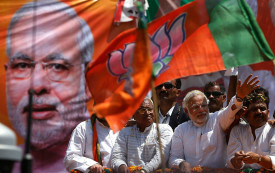 Could a Hindu Extremist Become India’s Next Prime Minister? Narendra Modi’s role in the horrific 2002 anti-Muslim pogrom in Gujarat has never been properly investigated, but now a timely new study is raising the right questions.